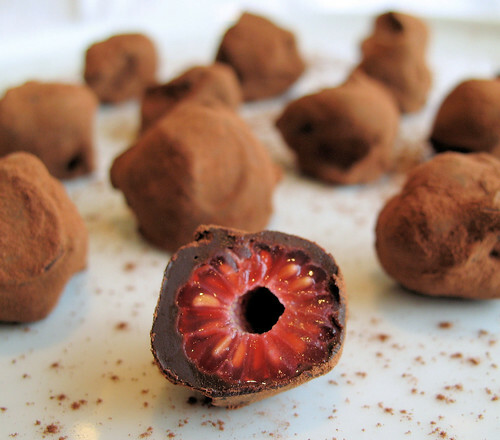 With the overload of raspberries from our garden, I was thinking of new ways to use them while fresh, and came across a recipe from the Epicurious website for Chocolate-Covered Raspberry Truffles. My heart almost stopped at the thought of chocolate and fresh raspberries together in a truffle, I was really going to look forward to this! I have to say that I was a bit disappointed. While the finished truffles do look mouthwatering, I don't think they are going to go to the top of my favourites list. On reflection, I think I prefer to bite into solid chocolate, I'm not so keen on the squishy centre of the raspberry - they might have been more to my liking if I had coated them again. Having said that, my husband liked them and most of them went happily to work with him in his lunchbox! 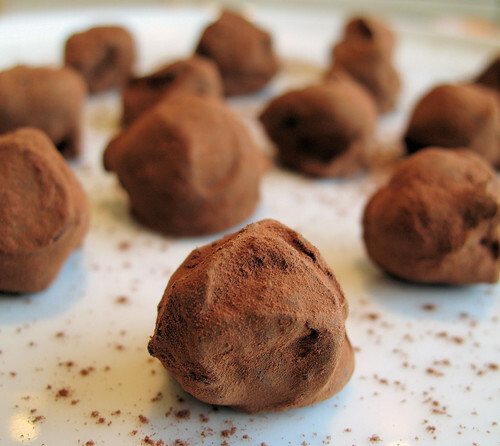 I made about half of this recipe and got about 35 truffles. Put the chocolate and cream into a glass bowl and heat very gently in the microwave for 1 minute - stirring every 20 seconds until chocolate is melted and mixed with the cream - it may take a couple of minutes depending on your microwave, or melt in a double boiler over simmering water. Put raspberries, a few at a time, into chocolate mixture and gently turn to coat using a fork or a teaspoon, then scoop them out, one at a time and put them onto a tray lined with baking parchment paper. 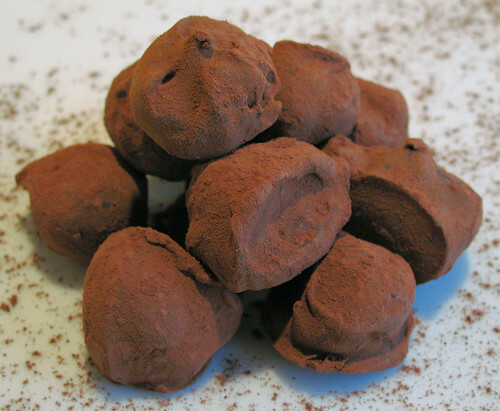 Put the cocoa powder into a plastic bag and add the truffles, shaking gently in the bag to coat them. Transfer onto a plate and keep chilled until ready to serve. These can be kept for up to 2 days in the fridge. Hmm...hope you can speak Spanish! I'm with you. I don't think I would really care for those truffles either, caring instead to indulge in a decadent mass of solid chocolate, but the picture is very good and I am impressed! Can't wait to see what you treat us to next! OMG I WANT SOME NOW!!! Marie - Welcome back - glad you had a great time in Canada! Hi there Steamykitchen - If I could send you some I surely would! I was so hoping this wud be selected. How glad I am now. Congrats on winning DMBLGiT! Congrats to you too! I loved how you coloured the sauce and chopsticks in your photo, very clever! Your picture of the half raspberry truffle is so enticing. I wonder if you dipped it in tempered chocolate first, let it harden so it would have a more solid mouth feel, and then dip it in the ganache. Maybe that would lend itself to a better texture. Or maybe filling the inside of the raspberry with chocolate before coating. It looks like such a crowd pleasing recipe, maybe with some experimentation, it could become great. Oh wow! I just saw this entry, and see you posted the most amazing looking truffles in the world - on my birthday no less :) Wow! Looks delicious, THANK YOU FOR SHARING! Bri - I think your ideas are great! I'll have to try that next time I make these, thank you! Hillary - thank you for your lovely comments and 'Happy Birthday' to YOU! You are right, they look heavenly! I think I will have to try them to satisfy my curiousity, if nothing else! I indulge myself on it.for sure i have to try it very soon and i simply Love your blog a lot dear.Keep rocking.